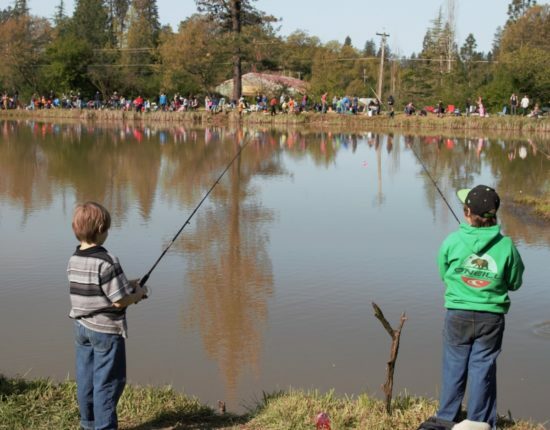 The 47th annual Trout Derby is Saturday, April 13 at Lions Lake at the Nevada County Fairgrounds. Sign up begins at 7 am and fishing is from 8 am to noon. This is for kids age 3 – 12. Two thousand Rainbow Trout will be stocked in the pond by the CA Fish and Game and the Sportsmen’s Club. Thank you to the Grass Valley Sportsmen for putting on this fun, free kids event! For more information, visit here. Tags: Lions Lake and Trout Derby. A beautiful sunset photo at Lions Lake at the Nevada County Fairgrounds and a nice way to end the week. Enjoy the weekend! Photo by 11:eleven photography. Habitat restoration update: Lions Lake is still closed to the public, but the wildlife are thriving (lots of goslings) and we’re adding water to the lake. We can’t wait to “unveil” the pond in a few weeks. A huge thank you to Nevada County Resource Conservation District for making this project happen and for restoring the lake for our community. Tags: Grass Valley, Habitat Restoration, Lions Lake, and Nevada County. Favorite photos from 2017: Lions Lake overlooking the RV Park at the Nevada County Fairgrounds. Photo by Suzy Calderon-Crabtree. Tags: California's Most Beautiful Fairgrounds, Fairgrounds, Grass Valley, Lions Lake, Nevada City, Nevada County, and RV Park. Reflection over Lions Lake at the Nevada County Fairgrounds.